So I decided I would make something quickly just for this purpose, and I thought I would use Ulquiorra, and then... this came out. o_0 (I did have some cool concepts for other wallpapers, but they were more complicated... hopefully I'll be able to do them in the future). I hadn't made a wallpaper in a long time and had been doing nothing but vectoring for a while, so this is sort of a different style than my previous wallpapers. I kind of like it, though. Hmm... I guess that's pretty much all there is to say. It couldn't have taken more than 5 hours (the clouds and sun took the longest), and it used around 25 layers or so. By the way, this is the 1024 x 768 version because apparently 1280 x 800 is not an accepted resolution here at Minitokyo. ~_~ So the original (and the best) version is here and there is also a 1600 x 1200 version here. Ah ha ha ha! It's so cute! *loves Ulqiorra to death* And I love the title you used... 'Patron Saint of Emo Kids' LOVE IT. I look forward to the new series. 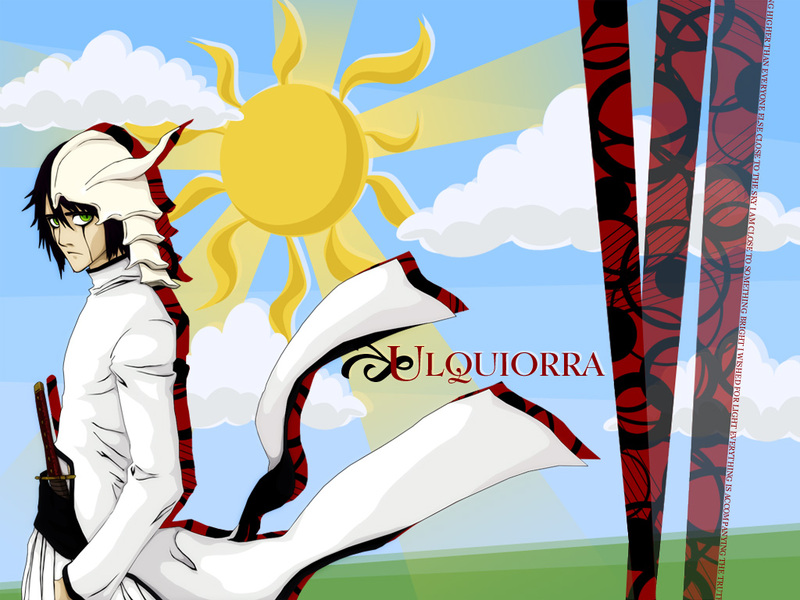 uuuuuuuuuuuuh ... the sun together with an Arrancar is quite ... *cough* unusual. However, he looks pretty 'lovable' here actually ^^; Great wallpaper! Thx so much for sharing. Ah ah, it's really fun! Very original!